The Denon AVR-X3500H is a premium 7.2-channel AV receiver which delivers audio quality only this sound giant can with 180 W per channel, made crystal-clear by advanced AL32 multichannel processing. It supports Dolby Atmos, Dolby TrueHD, DTS-HD Master Audio, and DTS:X for total home theatre immersion, and gives you 8 HDMI inputs (including 1 front) and 3 HDMI outputs (2 main + zone out). There’s even a phono input for those intent on embracing the unrelenting resurgence of vinyl. See, Denon really does think of everything when it comes to pure home theatre pleasure. The picture quality is superb, regardless of the source you choose, thanks to Advanced Video Processing with analogue-to-HDMI conversion. This means that your video content can be upscaled to 1080 p Full HD or 4K Ultra HD (60/50Hz). You’ll love the streaming versatility the built-in HEOS network technology offers. Playing music from any mobile device has never been easier or more future-proof. With the built-in HEOS wireless multi-room audio technology, you can seamlessly stream with Apple AirPlay 2, Wi-Fi, or Bluetooth, accessing all your favourite music services, like Spotify, Deezer, and Amazon Prime Music. Do you want to share content? 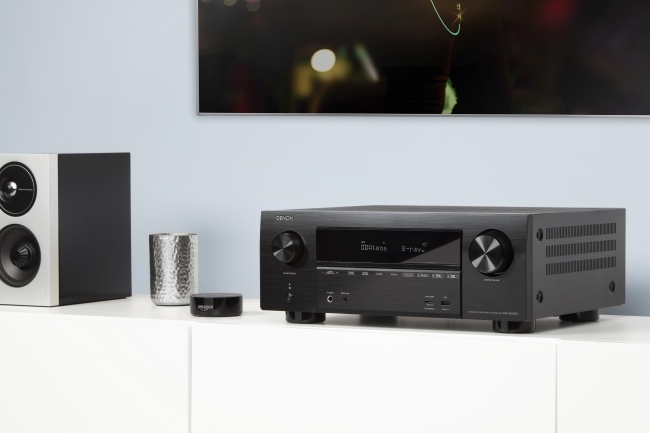 The Denon AVR-X3500H can also be used as part of a HEOS multiroom system, allowing users to share content throughout the house to other wireless speakers. Of course, having this much accessibility to entertainment can amp up your electricity bill, but relax, the Denon AVR-X3500H has that covered. A selectable Auto Eco mode will adjust the maximum power available according to the volume level you’re using and an on-screen Eco meter shows you the power saving in real time. So, you can indulge all your entertainment guilty pleasures with no guilt at all. If you’re not getting the ultimate experience out of your home theatre at the moment, Denon is a good place to start when it comes to the right tech for the job. Immerse yourself in home theatre the way it is supposed to be enjoyed.